HSINCHU, TAIWAN – January 31, 2019 – Andes Technology Corporation (TWSE: 6533), a founding member of the RISC-V Foundation and the leading supplier of 32/64-bit embedded CPU cores with solutions serving in excess of 3.5-billion SoCs covering a wide range of applications, today announced the free download of its AndeSight Integrated Development Environment (IDE) to accelerate software development for RISC-V based SoC. 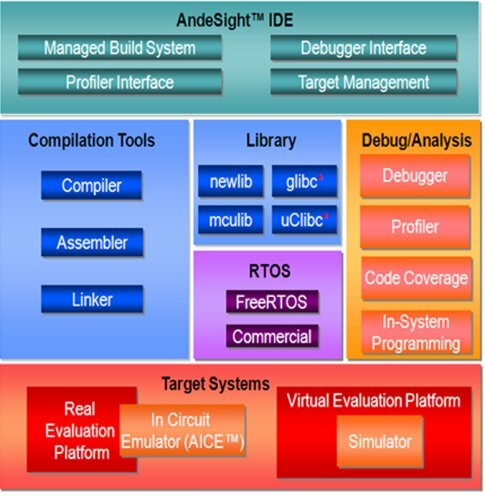 AndeSight IDE is a professional IDE based on Eclipse with many useful Andes add-on features, developed and widely used over the past 13 years, which provides an efficient way to develop embedded applications for RISC-V based SoC. AndeSight also comes with a highly optimized compiler to deliver best-in-class performance and code density. “Based on the successful experience in helping customers achieve cumulative shipments of more than 3.5 billion SoCs, AndeSight provides a professional embedded software development environment for RISC-V CPUs with its comprehensive and handy features.” said Dr. Charlie Su, CTO and Senior VP of Andes Technology. “With powerful AndeSight support, the software developers of RISC-V based SoC can deliver high-quality code with ease and speed their time-to-market”. AndeSight for Andes RISC-V cores, N25/N25F, NX25/NX25F, A25 and AX25, is available for free download now. The free download version is a full-featured AndeSight with a three-month time limit. To explore AndeSight’s rich features, please visit AndeSight introduction page at http://www.andestech.com/product-andeSight.php?cls=7 and download page at http://www.andestech.com/surpport.php?id=4 for more details. Andes Technology Corporation is a public listed company with well-established technology and teams to develop innovative high-performance/low-power 32/64-bit processor cores and associated development environment to serve worldwide rapidly growing embedded system applications. The company delivers the best super low power CPU cores, including the rising star RISC-V series with integrated development environment and associated software and hardware solutions for efficient SoC design. Up to the end of 2018, the cumulative amount of SoCs containing Andes’ CPU IP reaches 3.5 billion. To meet the demanding requirements of today's electronic devices, Andes Technology delivers configurable software/hardware IP and scalable platforms to respond to customers' needs for quality products and faster time-to-market. Andes Technology's comprehensive CPU includes entry-level, mid-range, high-end, extensible and security families to address the full range of embedded electronics products, especially for connected, smart and green applications. From 2017, Andes expands its product line and provides a total solution of RISC-V, the RISC-V series as V5 families processors cores include N25/NX25, N25F/NX25F and A25/AX25.